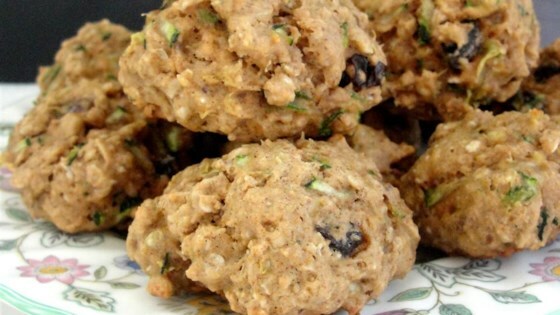 "In my efforts to use the abundance of zucchini in my garden I concocted this little cookie. I prefer my oatmeal cookies to have a little jazz, so if you are not a fan of ground cloves, they can be omitted. It's a not too sweet cake-like cookie that is perfect with your cup of coffee or tea." Stir together the flour, baking soda, cinnamon, and cloves in a bowl; set aside. Beat the butter and brown sugar with an electric mixer in a large bowl until creamy. Add the egg and the vanilla extract. Mix in the flour mixture and oats until just incorporated. Wring the zucchini in a clean towel to remove any excess moisture. Stir the zucchini and raisins into the dough; mixing just enough to evenly combine. Drop batter by rounded teaspoonfuls 2-inches apart onto the prepared baking sheets. Bake for 14 to 16 minutes or until the bottom edges turn golden brown. YUM!! Such a great recipe! But make sure to double it if you want a lot of cookies. The cloves and cinnamon added just the right flavor. These were too dense and cakey.